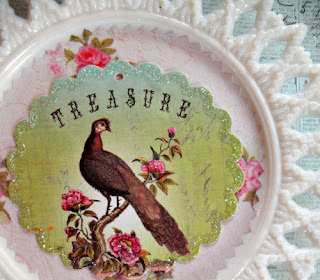 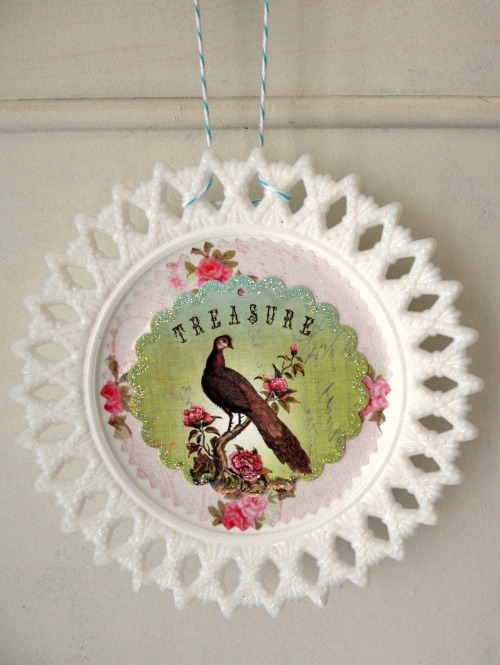 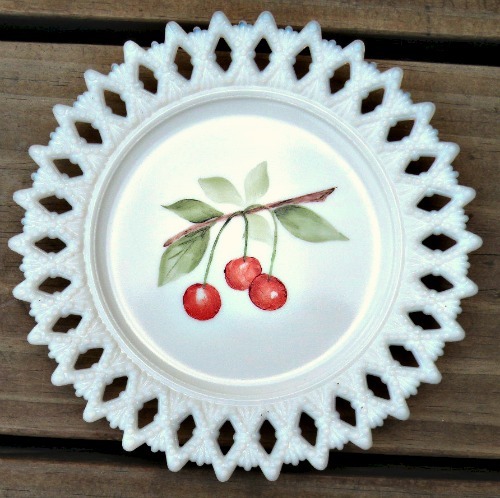 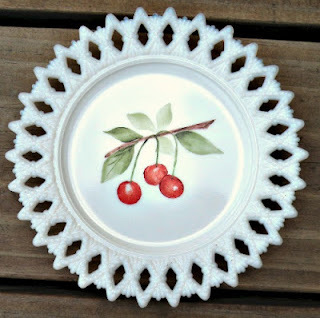 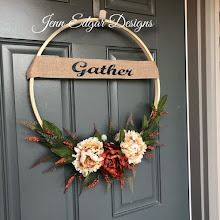 This week I have a quickie trash to treasure project that transforms an outdated decorator plate into a sweet sentiment for less than the cost of a greeting card. 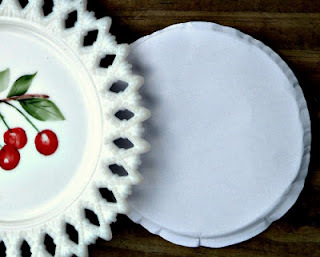 This pretty little plate features delicate edging but the center painting is a bit dated- delegating it to the no-man's-land cupboard high above the refrigerator. Using scrap papers, gift tags, and simple embellishments, this plate will enjoy the spotlight again. 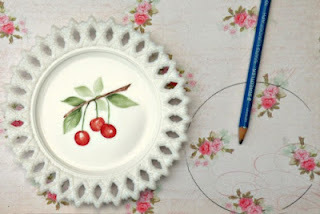 Using the bottom of the plate as a template, trace a circle onto the right side of scrap paper. Cut out the circle cutting about 1/4 inch in from your pencil line as the bottom of the plate is usually a bit larger than the front. Another trimming option is to place the circle cutout over the front indented space of the plate. 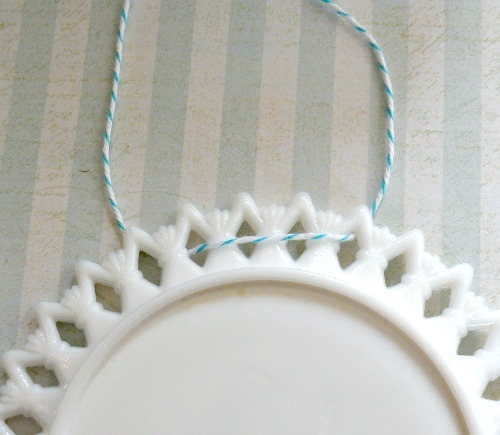 Using your thumb, press along the inside edge to create a pie crust effect that will give an accurate measure for snipping. 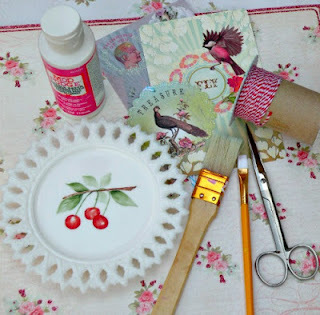 Use traditional scissors or create a decorative edge with scrapbook scissors. 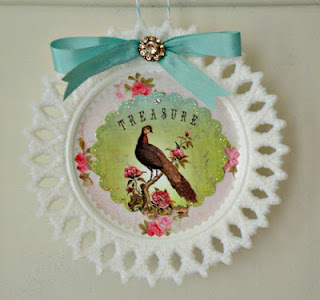 I am going with simple graphics- a combination of My Mind's Eye paper and a Papaya gift tag I saved from a recent gift. The key is to Mod-podge in layers. Don't rush to add everything at once. 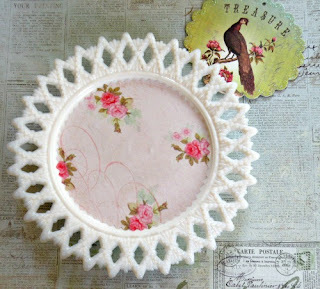 At this point I want to finish with a ribbon and some small embellishments. I pulled out some vintage bias tape, spare buttons, and a random rhinestone from the broken jewelry bin. 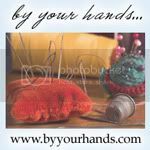 The ribbon has been weaved through the cutwork to hide the hanging twine and I stitched the button through the ribbon's knot. 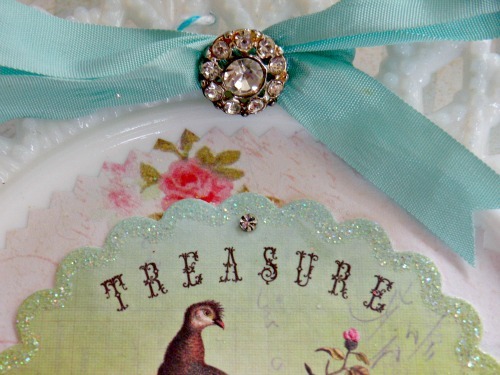 Just a dab of Mod-podge secures the rhinestone to hide the original hole at the tag center. 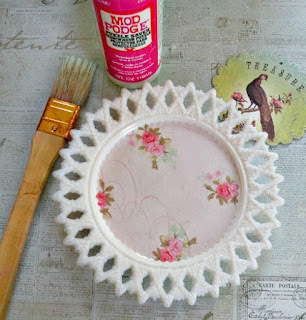 These little treasures take less than 30 minutes from start to finish and give an old decorator plate an instant face lift. 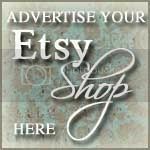 A perfect shabby chic treat for yourself or someone you treasure.